St. Anne's is one of the newest and most beautiful churches in Walkerville. The cornerstone was laid on November 17,1912, and the building completed a few months later [early 1913]. It was dedicated at 10 a.m. on Sunday June 22, 1913 by Rt. Rev. M. F. Fallon of London. The church as one of the finest organs in the Border Cities, an aeloian orchesterelle,the gift of Mrs. Edward Chandler Walker. The organ can be played both by hand and by record.In the basement of the churth there is a large auditorium and stage where concerts and plays are produced from time to time. During the winter months weekly card parties are held in the auditorium to advance the soical spirit among the members of the congregation. 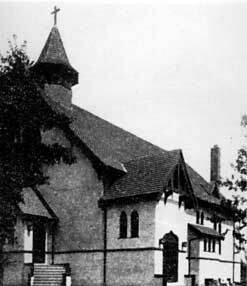 The parish of St. Anne's was founded on Jan. 3,1912 with Rev. Fr.H. N. Robert as pastor. In the beginning, Mass was celebrated in nearby St. Anne's school, Monmouth road. There were 35 to 40 families in 1912 to 275 at present. The area was originally part of the parish of Our Lady of the Lake [Our Lady of the Rosary], Ford City.